The possession of land, tenements, and hereditaments in Delaware can be transferred by a deed in writing and the legal estate will accompany the use and pass with it ( 101). A form for a conveyance of real estate is presented in 121 of the Delaware Revised Statutes. This form, if duly executed and acknowledged, is sufficient for a conveyance of real estate. However, the words "grant and convey" will operate as a special warranty against the grantor. But, in a warranty deed, the grantor warrants the title to the property to be indefeasible by anyone whether arising before or during the grantor's ownership. Warranty deeds must be signed by the grantor and acknowledged before they can be recorded. A deed for the conveyance of lands can be acknowledged in any county in Delaware, by any party to the deed, in the Superior Court, before any judge in Delaware, notary public, before two justices of the peace for the same county, or before the mayor of the city of Wilmington. Alternatively, a deed can be proved in the court by one or more of the subscribing witnesses ( 122). 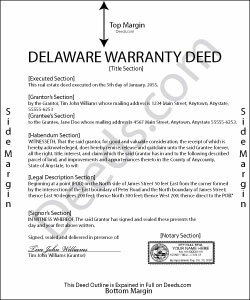 The acknowledgement or proof of the warranty deed should be in a certificate that is attached to or endorsed on the deed ( 123). A recorder will not receive a warranty deed for recordation unless it is accompanied by an affidavit of residence ( 9605). A warranty deed concerning land or tenements, acknowledged or proved and certified as provided, should be recorded in the recorder's office in the county wherein such lands or tenements are located ( 151). The recording of a deed in the recorder's office for one county will take effect only in respect to lands or tenements mentioned in the deed situated in such county ( 152). The priority of instruments is determined by the time of recording in the proper office ( 153). This type of recording statute is a pure race statute.